SCIENTISTS ALLREADY CORRECTLY NOTICED (ME ALSO FULLY AGREE)THAT THE CLOSEST WRITING SYSTEM TO THE SIGNS PRESENT ON TARTARIA TABLETS IS SUMERIAN PROTO-CUNEIFORM. THE PURPOSE OF PRESENT APPROACH IS ONLY TO TEST HOW CLOSE WOULD BE THE ROUND TARTARIA TABLET TO AEGEAN WRITING. 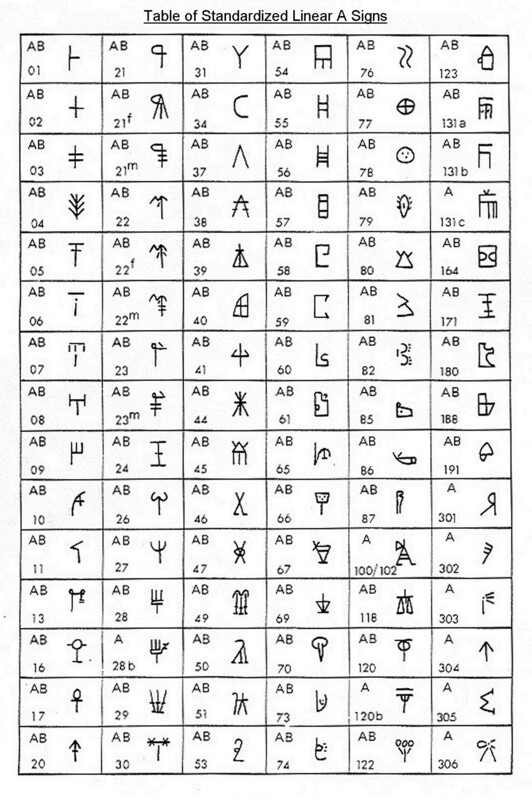 Not to wait till the finish, I am telling that the out of very few signs found, PA3,PA the tablet is not written in eny Aegean writing (Cretan Hieroglyphic,Linear A or Linear B)! I am studing these Tartaria tablets from more than 10 years. Soon after seeing their pictures, I was attracted bewitched/enchanted by the apparent close appearance of signs (especially the upper half of the round tablet) to those of archaic greek. (archaic eta=Heta; zeta,etc.) First af all it seems that ON ALL TABLETS THERE ARE A CONCOURSE OF DIFFERENT TYPE OF SIGNS (PICTOGRAPHIC,IDEOGRAM/SYLLABOGRAMS AND POSSIBLE LETTERS). – Nobody could explain an such early appearance of D-shape signs. 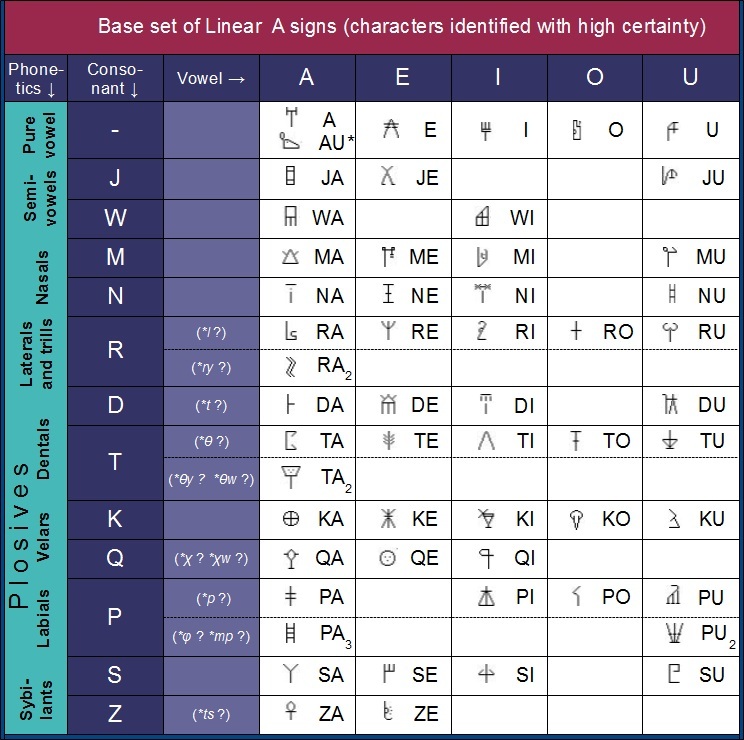 They appeared first in Europe in Linear B as representing volume measures units and later in archaic Greek. I had difficulties also with the bow-arrow and “>>” signs. 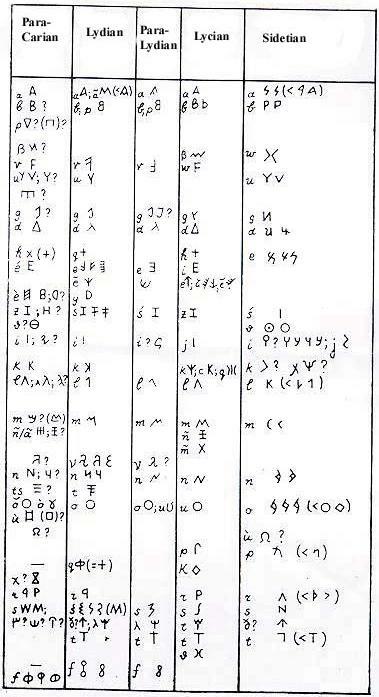 No one writing system could match found/read entirely. Don’t believe, this happened much easy when used the proto-cuneiform sumerian library of signs. 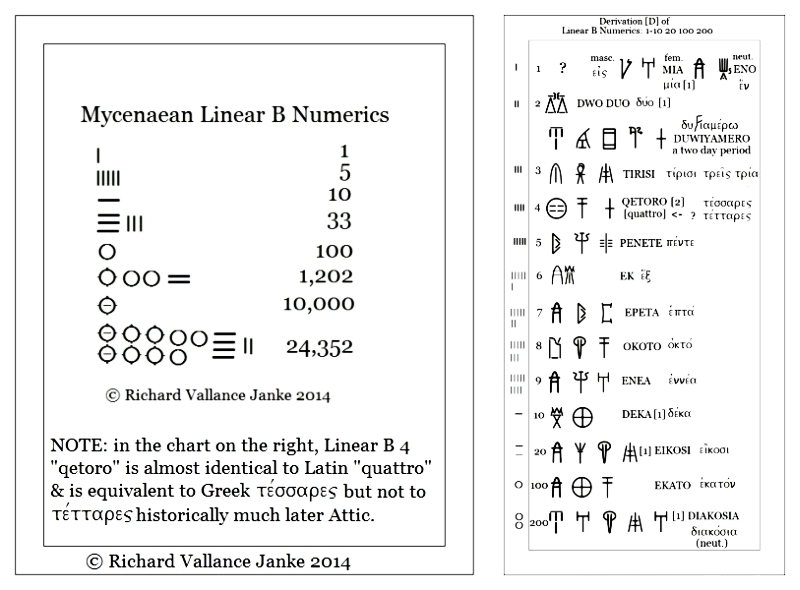 It seems that sumerians allready wrote novels before Aegeans passed from Cretan hieroglyphic to linear A> linear B. There is a span of close to 1.000 years (700), when they used writing (3.200 BC)before Aegean/Europe (2.500BC) begun. 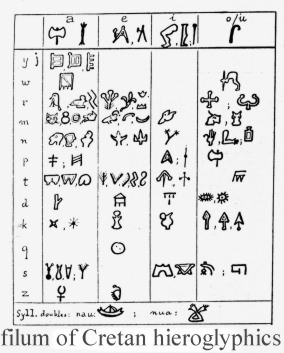 (3.200 BC sumerian proto-cuneiform and 2500 Cretan hieroglyphic and Linear A). This folowing picture is from hand-made by me replica. Note.Overall shape of the tablet (cross in circle) is above linear A shape AB77. .Fig. 54. – Symbols derived from the Egyptian Ankh. 1. The Ankh. 2. Two-armed Egyptian Form. 3 and 4. Hittite Types. 5. From Mycenaean Ring. 6. On Carthaginian Stele. The goddess Astarte is much like the contemporary Venus we see on Cyprus. Large holes apparently for ring decoration (referred to as being “pegged”), palm sized with stubby arms are a common style among other cultures too. The pinched face is found on the stubby armed figurines as well as the pillar shaped statuettes. Greek Mycenaean PSI type terracotta female, 1300-230 B.C. the very same idea is depicted here. Siggn “C” From http://people.ku.edu/~jyounger/LinearA/ Sign *034 has been suggested by several scholars to represent MNA (or, if a disyllabic value can be accepted, MINA), based on its resemblance to the crescent moon (Pope and Raison 1978, 28; Packard 1974, 107; Furumark 1956, 24). “oo“-signs: mycenaean”100 ;-100” so 200 ? See archaic Heta-like sign No.6 “NU”? *peh2- ‘protect; feed’ (آHittite:ً pa-ah-sa(pahsa): protect, guards 3sg.Skt. pa-ti ‘protects’) : *peh2-trom / *peh2-dhlom … OPULENT (same root [*op-1] as Lat. opera ‘works’ etc.). to reconstruct *h₃ … Ancient Greek: πατέομαι (patéomai, “to eat”). Folowing, the moon-like sign D-shaped ! THERE IS NO D-shaped sign IN AEGEAN WRITINGS EXCEPT for VOLUME UNIT ! b The Greek words ‘hedea’. (‘pleasant-things’} and ‘hedonai’ (‘pleasures’) can denote,. 61 firstly, things or events external to the agent, secondly,. 62 the agent’s bodily sensations, and, thirdly, certain. 61 In Homer, the word ‘hedu’ seems to function in much the same way as ‘gluku’-z’Sweet’), ..
signs PA Moon > PA–MENI, PAMMENOS :”ALL MONTHs=(this) YEAR !! From https://archive.org/stream/dumezil-archaic-roman-religion-with-an-appendix-on-the-religion-of-the-etruscans-part-1/dumezil-archaic-roman-religion-with-an-appendix-on-the-religion-of-the-etruscans-part-1_djvu.txt This is the list of specialized entities whose names the flamen of Ceres recites when he sacrifices to that goddess and to Tellus ( quos inuocat pamen sacrum ceriale faciens Telluri et Cereri ). PAi, as in PASIPFAI ; PA=PASI =”All” as in Pasitheoi “all gods” PA/PAi -(whatever Moon name) >? PA/PAi–Mi-Ni(mene,meinei) =”ALL/LIGHTED MOON” ?? P.S. One would think “all Moon” as Full Moon or as entire phases…. 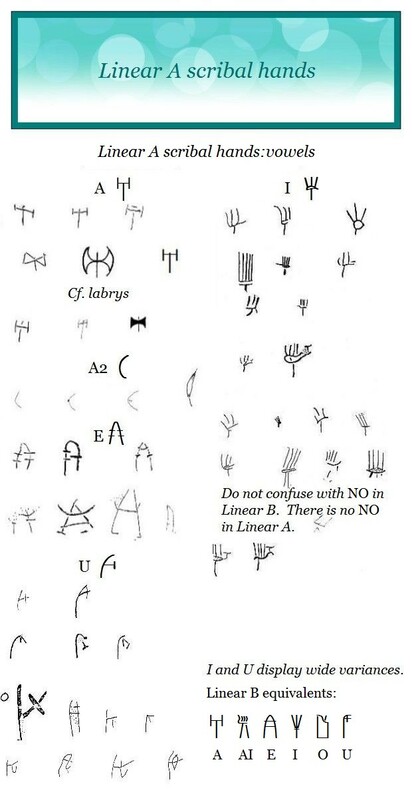 Upper signs,left-one:” bow-arrow” THERE IS NO SUCH A SIGN IN AEGEAN WRITINGS ! ——————————————————————————– Next right sign “>>” THERE IS NO SUCH SIGN IN AEGEAN WRITINGS ! This entry was posted on March 18, 2018 at 2:49 am and is filed under History, LINEAR A/B, Tartaria tablets. You can follow any responses to this entry through the RSS 2.0 feed. You can leave a response, or trackback from your own site.